Justin Morgan (second from left) and Canadian Ambassador to the Philippines Neil Reeder (first from right) visited the students of Balangiga Central Elementary School in Eastern Samar. GUIUAN, Eastern Samar – Canadian Ambassador to the Philippines Neil Reeder recently visited Eastern Samar, a province devastated by Typhoon Haiyan (local name: Yolanda) nearly two years ago. The Canadian government was among the first countries to pledge and support the Philippines after the super typhoon hit the country. Ambassador Reeder visited Lawaan and Balangiga, two of the five municipalities in Eastern Samar which received the Canadian government-supported Sanitation Repair Kit Project which helped repair toilets of households in the communities. In Balangiga, Reeder met with the “hygiene ambassadors” of Balangiga Central Elementary School, who regularly teach the students the importance of proper hygiene by leading them in regular hand-washing and tooth-brushing activities in the school and in the community. 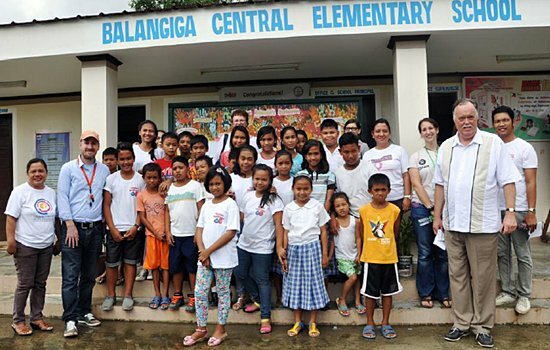 Portion of the Canadian funding aid received by the Balangiga Central Elementary School also went to the rehabilitation of its jetmatic pump that was destroyed during the typhoon. These projects provided the school with good water connection. It also supported the construction of communal latrine in several barangays. Reeder also visited the declared Zero Open Defecation and G1 (households that already have individual latrines) communities in the municipality of Lawaan as well as the beneficiaries of the cash for asset recovery program, an unconditional cash grant to inject cash into the market for their immediate recovery. During the visit, Reeder met Larry Gacho, one of the recipients of the program. Larry is a proud member of the LGBT community who started a parlor home service after Yolanda. “With the P3,000, I bought my own parlor kits and essentials, and started offering home service such as haircuts and hair coloring to my neighbors. And now, I am proud to show to all people who are helping Yolanda victims like me that the assistance they provided was not put to nothing,” said Gacho. “The building back better of Yolanda-affected communities lies in the support and cooperation of different sectors, whether government and INGOs. We are hoping to continue this good partnership with our donors like the Canadian Government so that we can reach more people and create lasting impact in their lives even after emergencies, towards economic justice,” said Justin Morgan, Country Director of Oxfam in the Philippines. The Canadian Government, through the International Humanitarian Assistance and the Department of Foreign Affairs, Trade and Development, supported Oxfam’s Water, Sanitation and Hygiene (WaSH) programme in Eastern Samar, ensuring 8,500 of the most vulnerable families have access to safe water, sanitation, and hygiene. The funding support enabled Haiyan-affected families, most especially women and children, to protect themselves from public health risks and received life-saving needs related to WaSH in the aftermath of the typhoon. PASAY CITY – Sen. Chiz Escudero said the Department of Transportation and Communications’ (DOTC) P43.5-billion budget request for 2016 should allow it to field more trains, end long queues at MRT stations and start the long-delayed line extension projects, since almost 41 percent of the agency’s proposed spending plan is earmarked for the rail sector. Escudero, who was former chair of the Senate Committee on Finance until he resigned on July 28 out of “delicadeza,” said that based on the DOTC request, it plans to spend some P15.7 billion to address the problems plaguing not just the MRT, but the Philippine National Railways (PNR) and the LRT, as well. According to Escudero, it is only right to attach “measurable performance” to every peso that the DOTC is asking in taxpayers’ money to subsidize the rail operations. “The DOTC says it will speed up transfer time in stations from 10 minutes this year to 5 minutes next year. Ang una ngang dapat itanong 10 minutes nga lang ba ang waiting time sa MRT ngayon?“ Escudero said. The DOTC also vowed that overloading in MRT trains would go down to 157 percent from to 171 percent. “Is this decrease in load factor doable or drawing lang? Ilang bagong train ba ang parating para masabi natin na maiibsan na ang siksikan?“ the senator added. These pledges are among the MRT-related performance indicators the DOTC has spelled out in the national budget. The latter would cover deficiencies in “settling prior and current years’ obligations for equity rental, maintenance fees and others obligations” in case “farebox revenues” are insufficient to cover those, Escudero said, explaining the special budget provision the DOTC wants to govern its use. One such firm is the Philippine National Railways (PNR), whose performance guarantee is to provide “safe and reliable rail services for the Metro South Commuter Services,” the line running from Tutuban, Manila to Calamba, Laguna. The government is asking P1.32 billion in operating subsidy for the PNR for 2016. Another budgetary subsidy – to the tune of P1.42 billion – is being set aside for the Light Rail Transportation Authority (LRTA), with the promise that the agency will field one train every 3 to 4 minutes during peak hours in its Roosevelt-Baclaran Line 1 and one every 5 to 6 minutes in its Pasig-Recto Line. “Kaya dapat itong mga pangakong ito ilagay sa tarpaulin sa bawat istasyon. Because these promises are not just made to Congress but to taxpayers who, by their payments, fund the national budget,” Escudero said. The amount requested for LRTA is on top of the P6.75 billion “construction budget” the DOTC is requesting for various LRT extension projects, such as P1.62 billion for the LRT Line 1 Cavite Extension Project and P2.9 billion for the LRT Line 2 Extension Project. The DOTC is seeking P43.5 billion for its 2016 spending plan. This does not include, however, budget subsidies to state corporations. MGen. Jet Velarmino AFP, Commander 8ID, with Most Rev. 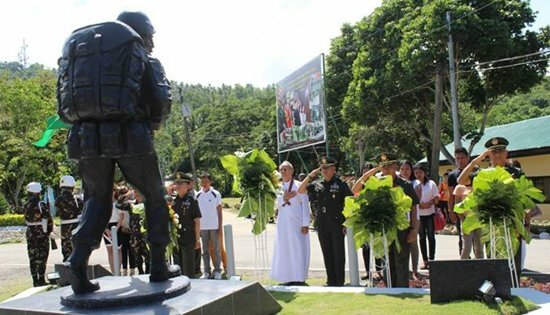 Leopoldo Tumulak, Military Bishop, and the 3 brigade commanders in a wreath laying at Stormtroopers Warrior monument ICOW during the 8ID's 27th Founding Anniversary celebration on August 4, 2015. CAMP VICENTE LUKBAN, Catbalogan City – The 8th Infantry (Stormtroopers) Division, Philippine Army marked its 27th Founding Anniversary with the theme “8ID at Sambayanan, Dalawampu’t PitongTaong Nagkakaisa Tungo sa Kapayapaan at Kaunlaran” at Headquarters in Camp Lukban, Brgy Maulong, Catbalogan City, Samar on August 4, 2015. The event was highlighted by a wreath-laying ceremony led by Most Rev. Leopoldo S. Tumulak D.D, Bishop, Military Ordinariate of the Philippines and Major General Jet B. Velarmino, Commander 8ID, for the Stormtroopers who passed away for the past year. The wreath-laying was in honor and recognition of the soldiers’ heroism and ultimate sacrifice for in pursuit of peace in Region VIII. The ceremony was attended and witnessed by the soldiers’ love ones, as well as officers, soldiers and civilian employees of the Command. Another highlight was the recognition of officers and soldiers who made significant contribution to the accomplishments of their assigned tasks in combat operations and in administration that significantly contributed to the overall success of the Command’s mission. In addition, civilian stakeholders who worked with the Command were also given due recognition during the event. Later in the evening, the celebration was capped by the “Stormtroopers’ Cultural Night”, an activity that showcased the rich culture of Filipinos through a cultural dance competition which was participated by different units of the Command. Gracing the 27th Founding Anniversary of 8ID was the presence of Bishop Tumulak, Bishop of Military Diocese as the Guest of Honor and Speaker; Major General Jet B. Velarmino, Commander 8ID; Hon. Stephanie Uy-Tan, Mayor of Catbalogan City; Christine C. Caidic, 8ID MSAB Chairperson; Brigadier General Herminigildo C. Aquino, 803rd Brigade Commander; Brigadier General Leoncio A. Cirunay, Commander 801st Infantry Brigade, Col Dinoh A. Dolina, Commander 802nd Infantry Brigade and media personalities. Looking ahead to the challenges that 8ID hurdled for the past year, Major General Velarmino said that the Command has accomplished much in performing its mandated task of protecting the people because of the unity and dedication of the troops in performing their duties. In his remarks, he challenged his officers and men and said that as long as we have faith to accomplish our just cause, coupled with unconquerable will to win, victory will not be denied us of any undertaking we have at hand and in the future. TORONTO, ON – The Canadian Football League's first policy on violence against women seeks to prevent violence in the first place, respond quickly on behalf of those harmed when it does occur, provide help to those affected by it and seek behaviour change from anyone found to be perpetrating violence. "The CFL condemns violence against women in all its forms: domestic violence, sexual assault, verbal abuse and the disrespectful and damaging attitudes that can form the foundation for violence," said Jeffrey L. Orridge, Commissioner of the Canadian Football League. "This policy is designed to ensure all of us in the CFL do our part to educate for change, and support behaviour change when we do encounter violence or the attitudes that can lead to it." The policy was developed in partnership with the Ending Violence Association of Canada and following consultations with multiple women who are experts in the field of responding to violence against women. These experts work regularly with CFL teams to deliver outreach and public education programs. "We will work to ensure all of our workplaces are safe from violence against women, and that the attitudes that allow violence to occur are not tolerated," Orridge said. "In the face of a report of violence against a woman perpetrated by any CFL employee, we will always take it seriously. Doing nothing will never be an option." - The policy applies to everyone who works for the CFL – not just players, but coaches, officials, executives and staff. - Everyone in the CFL will receive mandatory training on violence against women and the issues surrounding it on an annual basis. - The CFL will support, endorse and participate in efforts to increase awareness of violence against women and ways to prevent it throughout society, and in particular among Canadian youth. - When any CFL workplace, including a CFL football club or one of its corporate offices, receives a report of violence against women involving a CFL employee, we will act. - We will assess the situation and future risk to the women in question, and engage when necessary local experts who will make up violence against women response teams (VAWR teams). These VAWR teams will be made up of social workers and other professionals with extensive experience in dealing with violence against women. - These VAWR teams will provide the best possible support and referrals to the women affected, ensure counselling is provided where it is deemed helpful to the men involved, and will strive to act always in the best interests of any children involved. - We will always err on the side of safety, respect for the sanctity of human life, and every person's inherent right to security from harm. - We will not act as criminal investigators, fact finders, judges or juries: our focus is on providing access to experts who can intervene in a situation, assess the risk to the woman, mitigate any harm in the best way possible, seek behaviour change on the part of perpetrators and contribute to positive outcomes for individuals, families and communities. - In cases where there are clear and documented cases of violence against women -- determined by the police, the courts, or confirmed by the perpetrator -- the CFL will impose sanctions. - The CFL will also impose sanctions when there has been a clear violation of protection orders or other directives put in place by the courts or police, as such violations are clear indications of higher risks of violence. - These sanctions will range from suspension for single or multiple games to a lifetime ban from the CFL, depending on the severity and number of incidences. - In determining sanctions, the Commissioner will consult a list of offences, including sexual assault, domestic violence, and violation of protection orders or other directives provided by the courts or police, as well as guidelines prepared in consultation with experts on violence against women. - These sanctions will be subject to the provisions and processes of the league's collective bargaining agreement with the CFL Players Association, and in the case of other employees, their employment agreements and employment law. "The leadership being shown today by the entire CFL is to be applauded profoundly," said Tracy Porteous, the Chair of Ending Violence Association of Canada. "Violence against women has long thrived in the shadows so when organizations, especially those led by men, step forward to ask, 'what can we do to break the silence?' it shines an important light on a subject most people don't know what to do with. Through this policy the CFL is changing history." The policy announcement followed news that the BC government is renewing funding for Be More Than a Bystander, the very successful anti-violence against women program that is a partnership between the CFL's BC Lions and EVA BC. Be More Than a Bystander is just one of the many such programs led by several CFL teams who are working in their communities to raise awareness of violence against women. "Our players are truly leaders when it comes to generating awareness on this very important issue," said Scott Flory, President of the CFL Players Association. "Several of our players, on a league wide basis, are out in the community changing mindsets about violence of all kinds, especially violence against women. They are reaching out to all ages and demographics with special attention paid to youth in schools." Domestic and sexual violence most often take place out of the public eye and are deemed the most underreported of all violent crimes in Canada. The main intent of the policy, in all circumstances where abuse or violence has been alleged, is to assess the risk, reduce or eliminate that risk, mitigate harm and promote positive change. "In talking with women's groups, we were struck by the fact that they put the emphasis on protection and support for a woman at risk, and supporting behaviour change on the part of perpetrators, while others can tend to measure a policy purely by how tough or punitive it is," Orridge said. "For example, the women we worked with on the policy spoke to us more about whether a woman's life could be at risk, than whether her spouse was going to be punished. In fact, some said that removing an employee's ability to make a living could affect his ability to provide child support, which would negatively affect his former partner and their kids." Under the policy, sanctions that involve suspensions and loss of income will only be an option if or when allegations are substantiated and the safety of a victim and/or community members has been compromised. But whether there is 'proof' of an allegation or not, no report will be ignored. Every situation will be assessed, with experts called in when necessary, and help will always be offered. With the policy now endorsed by the CFL Board of Governors, the league's teams will work with the league office and the Ending Violence Association of Canada to identify the right regional experts to provide training, assessment and counselling services. "Any policy evolves with time, and this one will. But this represents an important step forward for the CFL," Orridge said. QUEZON CITY – Today, environmental group Greenpeace, along with various stakeholders from the food and nutrition research sector, the agriculture industry, the academe, religious groups and other civil society organizations convened to discuss and address the country’s food and nutrition gaps that, if left unattended, could lead to a ‘food emergency situation’. In recent weeks, the country has witnessed several food scandals – with alarming news of fake rice and fake noodles out in the market, to various food poisoning incidents in different parts of the country. There is also the latest poll from the Social Weather Stations that revealed how 37% of families (or an estimated 8.1 million) consider themselves as food-poor, while 12.7% of families (or an estimated 2.8 million, have experienced involuntary hunger at least once in the past three months. Greenpeace recently launched an online survey on what Filipinos normally eat everyday. Dubbed #AnongFoodMo, the crowd-sourcing initiative was aimed at social-media savvy folks who are unaware of the role they play in shaping the country’s food and agriculture systems which are vital in solving the country’s hunger and food insecurity. Results from the 2013 National Nutrition Survey show that the Philippines is faced with a double-burden of malnutrition: under nutrition among children and over nutrition among adults. “Sad to say, but this is a result of Filipinos not having equal access to healthy and nutritious food,” said Dr. Cecilia Cristina Santos-Acuin, Chief Science Research Specialist of the Food and Nutrition Research Institute. QUEZON CITY – Karapatan and Breastfeeding Philippines, a program of Nurturers of the Earth, urged both houses of Congress to conduct a congressional hearing in aid of legislation on Republic Act 10028 (The Act Expanding the Promotion of Breastfeeding) in relation to the condition of political prisoner Miradel Torres, a breastfeeding mother, and his son Karl. Torres and son are both detained at the Taguig City Jail (TCJ) in Bicutan. In a letter to Senators Grace Poe, Pia Cayetano, and Aquilino “Koko” Pimentel III, Karapatan urged the amendment of RA 10028 so that “the right to breastfeed of mothers and babies like Miradel and Karl would be guaranteed under the law.” The same request was submitted by the Breastfeeding Philippines to the House of Representatives through the Gabriela Partylist. Both groups emphasized that while it is “critical that Karl be taken out of prison with his breastfeeding mother,” it is also necessary “to put breastfeeding mothers and babies like Miradel and Karl under protective custody of any government or non-government institution is willing to take them under their wings,” while in detention. “They should also be given additional food provision needed to nourish a breastfeeding mother and for Karl’s complementary feeding,” the letter stated. Miradel Torres was three months pregnant when arrested in June 2014 and gave birth to baby Karl in November 2014. Karl is now eight months old. 8ID chief MGen. Jet Velarmino and Catbalogan City mayor Stephany Uy-Tan with 8ID troops during the tree planting held on July 30, 2015 at Diversion Road in Catbalogan. 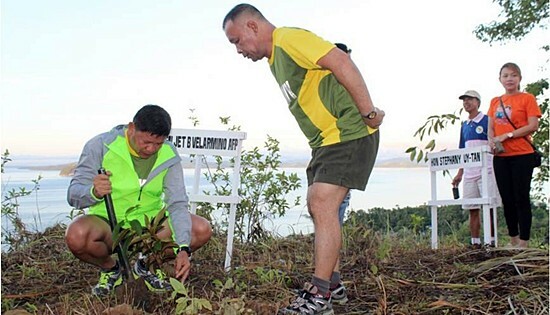 CAMP VICENTE LUKBAN, Catbalogan City – The 8th Infantry Division, Philippine Army held a tree planting activity near the newly-constructed Diversion Road at Barangay Maulong, Catbalogan City on July 30, 2015. The tree planting activity was led by Maj. Gen. Jet B. Velarmino AFP, Commander of 8ID and Hon. Stephany Uy Tan, Mayor of Catbalogan City. Aside from soldiers and the entourage of the Hon. Uy-Tan, the activity was also participated by members of Kabalikat CIVICOM, Catbalogan City Chapter. A total of 1,250 assorted fruit-bearing and non-fruit bearing trees were planted by the participants and it brought the total of trees planted by the Division to 3,388 trees since January 2015. Meanwhile, 8ID in partnership with the Philippine National Red Cross-Leyte Chapter headed by Ms. Leonel Maderazo held a bloodletting activity dubbed as “Dugong Alay, Pansagip Buhay” on July 29, 2015 at 8ID Multi-Purpose Hall. A total of 21,150cc of blood was donated by 47 donor soldiers coming from different units of 8ID. The Tree Planting and Bloodletting activities were part of the planned series of activities in relation to the 27th Founding Anniversary of 8ID on August 4, 2015.